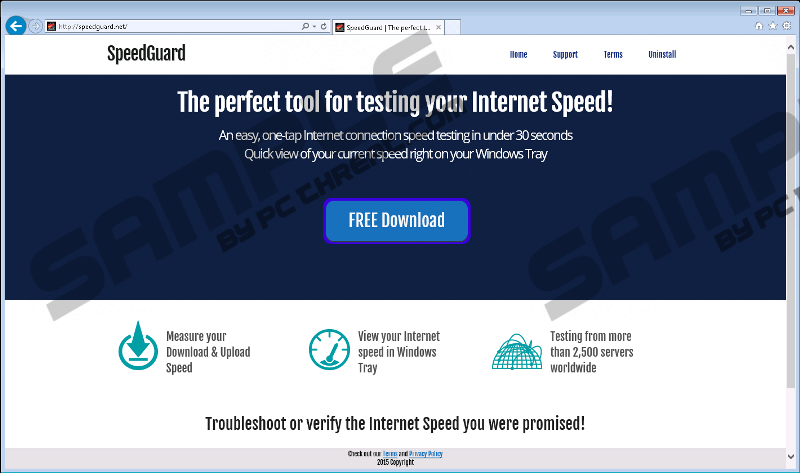 SpeedGuard is one of those programs for checking the speed of the Internet connection. It claims that it measures your current speed against major servers around the globe, so it really seems that it is a powerful application. Even though it seems to be a useful program, we do not think that you will still say that you want to keep this software when you find out that it might cause harm to your system. The program itself is not very dangerous; however, it shows commercial advertisements that might redirect to untrustworthy websites. As can be seen, SpeedGuard is not a perfect program, even if it promises to act in a beneficial way, so it is not worth keeping this application installed on your system. In order to help you delete this adware, we have prepared the manual removal instructions for you. We highly recommend reading through this article first. Since SpeedGuard is an advertising-supported application, it will start showing commercial advertisements instead of helping you to find out the speed of your Internet connection. According to our researchers, the biggest possibility is that you will see pop-ups, coupons, and other commercial ads. You might not associate the presence of these ads with SpeedGuard at first; however, there is no doubt that SpeedGuard generates advertisements. Of course, your system might contain other adware programs that display advertisements, so it does not mean that SpeedGuard is the only unwanted program if you ever detect it. Our specialists suggest that you remove SpeedGuard because its ads might expose you to malware. You might be able to protect your system if you do not click on ads; however, there is still a possibility that you will click on them accidentally. Therefore, it is better to eliminate SpeedGuard fully. This advertising-supported application is not the only one that exists. According to our specialists, you should be very cautious in order not to allow Price-Hipo, DealBarium, ProShopper, Price-Horse, and similar programs to enter your system. All of them act in the same manner as SpeedGuard, which means that you will definitely start seeing hundreds of ads on your screen. You have to know that adware programs also collect information about a user’s online behavior, and might even connect to the Internet. As can be seen, adware is not as innocent as it might seem at first sight, so you should try to do everything that is possible in order to prevent them from entering. There are definitely more reliable tools for checking the speed of your Internet, so there is no point in keeping SpeedGuard, which is a suspicious program. The easiest way to eliminate this program from your system is to scan the system with an automatic tool. Of course, it is also possible to eliminate it manually. The automatic method is definitely more trustworthy because it is enough to scan the system once in order to get rid of different kinds of infections hiding on your computer. Quick & tested solution for SpeedGuard removal.